Yes, now you can learn martial arts the fast and easy way in the comfort of your own home! That's right. All you need to do is scrape up some pocket change and we'll rush you deadly Asian fighting secrets never before revealed! Martial arts enthusiast Dan Kelly has compiled an interesting albeit hilarious collection of mail-order self defense courses from yesteryear. Talk about "buyer beware"! I know I'm giving away my age here, but some of these ads I actually remember. They were typically found on the back pages of many popular comic books which also carried products like X-Ray Glasses and the now classic The Day Mac Became A Man ads that were run by bodybuilding guru Charles Atlas. 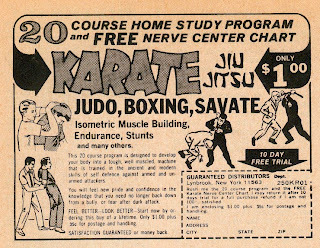 The credentials of some of these so-called karate masters that were featured on these courses were questionable to say the least. Needless to say, most of the ads were geared toward testosterone driven young men who either thought that learning martial arts overnight would turn them into chick magnets, or had visions of becoming the next Kato (Bruce Lee's first TV gig as a kung fu crime-fighting superhero c. 1965). There was still some public naivete in the West about the martial arts during the era that these ads ran; it was a time when judo was popularly used as a generic term to describe any martial-art style, and black belt "holders" were regarded as invincible warriors. I truthfully never knew anyone who actually sent away for one of those pseudo-self defense courses. One friend of mine did get the Charles Atlas Dynamic Tension muscle building program. I got the X-Ray Glasses. And somewhere Bruce Lee is having a really good laugh. What a blast from the past. I remember my first martial arts books, by Bruce Tegner. Remember Count Dante? I believe he really must be having a good laugh. Someone must have purchased these courses otherwise you wouldn't have seen them so prevelant in the books. Didn't it cost them money to place these ads there in the first place? Like the saying goes "There's a sucker born every minute." The Count Dante ad is the one that really stuck in my mind through the years. Sure it cost $$ to place those hokey ads. I wonder how many of those courses were actually sold. If you go to the page, and check out the links at the bottom. By following the links, you can eventually find some clips of the count. I think I may have told you before about a guy who showed up at our dojo proclaiming that he was ready for his black belt because he had trained at home through videotapes. My instructors said they got a good laugh, especially when he dropped into a split while sparring. The concept must work because these types of adds still exist, in a more modern style (like this add). "My instructors said they got a good laugh, especially when he dropped into a split while sparring." By a concept that works I mean that the person selling it must make money... Not that it works for the person buying it. "I got my black belt from my VCR." Actually, it's funny, I was going to write a piece about the modern video/DVD thing, and then I stumbled onto a site that had all those old ads. I grew up with those ads! I suppose these crazy marketing schemes just change with the times. ...he dropped into a split while sparring. Sounds like a James Brown move! There are a few of those Villari schools in the NY area. Thanks for that link. Amazing. Apparently the founder is credited with combining (among other things) Shaolin and Kempo. Kempo (chuan fa) is Japanese for "Chinese Boxing", and Shaolin is just one version of Chinese Boxing. Shaolin is Kempo. Advertisers rely, or rather prey, on the uninformed. Looking at a recent edition of Black Belt or Inside Kung Fu magazine, can you honestly say that anything has changed? You can not believe the memories that came flooding back when I viewed the ads. I remeber all of them and even ordered the Charles Atlas body building couse when I was about eleven. I posted the link on my blog and gave you credit for the source, thanks for the laughs! Other than the home training courses which I believe are a just a device to make money (as opposed to offering something really constructive), most of the ads I see in Black Belt magazine seem to be fairly legit. Of course there will be a few that are off the wall. I've never checked out Inside Kung Fu. Bear in mind that the ad that you see at the top of my article, and the ones from the link I included, appeared mainly in comic books, not martial-art publications of that time. Eddie! Where have you been?? It seems that everyone from our generation got the biggest kick out of this. It brought back memories for me as well. Thanks for the link. As usual, great post. And great comments too! Pretty funny.